A lush and thrilling romantic fable about two lovers set against the scandalous burlesques, midnight seances, and aerial ballets of the 1898 Omaha World's Fair. On the eve of the 1898 Omaha World's Fair, Ferret Skerritt, ventriloquist by trade, con man by birth, isn t quite sure how it will change him or his city. Omaha still has the marks of a filthy Wild West town, even as it attempts to achieve the grandeur and respectability of nearby Chicago. But when he crosses paths with the beautiful and enigmatic Cecily, his whole purpose shifts and the fair becomes the backdrop to their love affair. One of a traveling troupe of actors that has descended on the city, Cecily works in the Midway's Chamber of Horrors, where she loses her head hourly on a guillotine playing Marie Antoinette. And after closing, she rushes off, clinging protectively to a mysterious carpetbag, never giving Ferret a second glance. But a moonlit ride on the swan gondola, a boat on the lagoon of the New White City, changes everything, and the fair's magic begins to take its effect. 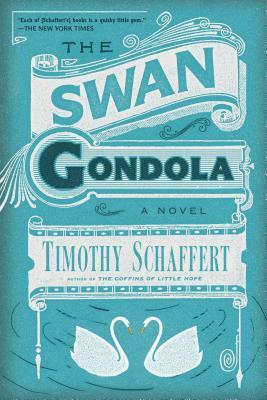 From the critically acclaimed author of "The Coffins of Little Hope," "The Swan Gondola "is a transporting read, reminiscent of "Water for Elephants "or "The Night Circus. Timothy Schaffert grew up on a farm in Nebraska and now lives in Omaha. He is the author of four previous critically acclaimed novels, which have been among Barnes & Noble Discover Great New Writers selections, Indie Next Picks, and New York Times Editor s Choices. Schaffert teaches creative writing and literature at the University of Nebraska Lincoln."